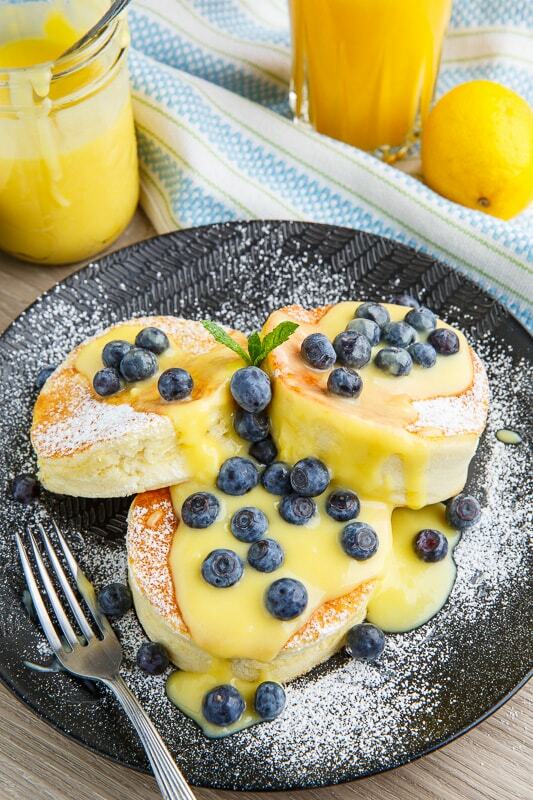 Super fluffy Japanese style souffle pancakes with fresh lemon curd and blueberries! 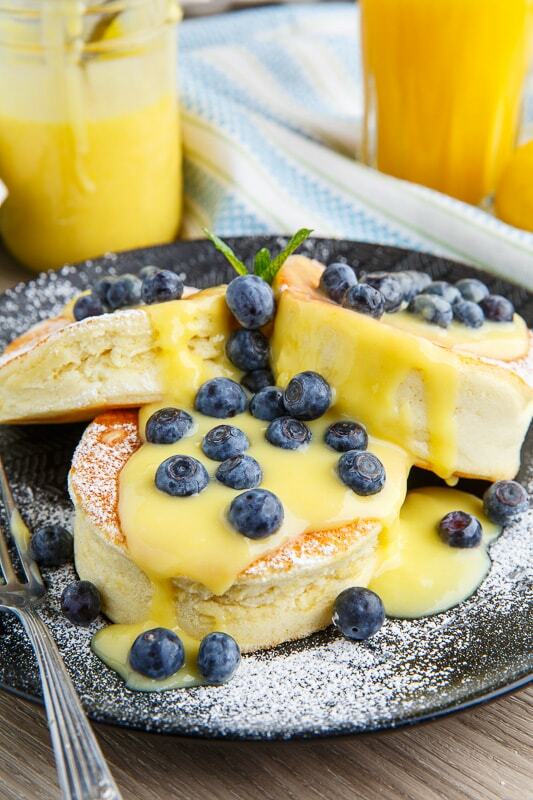 For Mother’s Day I often like to go with a nice breakfast in bed or brunch recipe and these Japanese souffle pancakes with lemon curd and blueberries are a great way to go! These pancakes are so light, fluffy and tall, just like a souffle, but a pancake, for breakfast! That massive rise comes form a few different factors the first being using more eggs, and separating them and beating the whites before gently folding them into the batter. Regular pancakes would just mix the whole eggs into the batter and beating them adds plenty of air and thus rise to these pancakes. (Try this the next time you make your regular pancake recipe!) Next up is using baking powder and baking soda, both of which add to the rise in pancakes but when you combine them with an acidic like buttermilk you get even more rise! 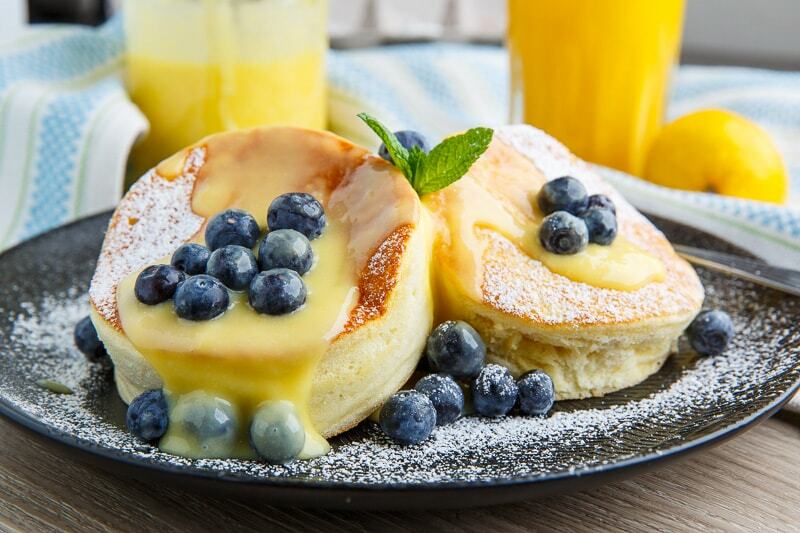 Pancakes include a fat which can be oil, butter or in this case mayonnaise which also adds to the rise factor on the count of the acidic (vinegar or lemon juice) in it. Finally, the pancakes are cooked in a ring to ensure that the batter bakes up rather than spreading out! 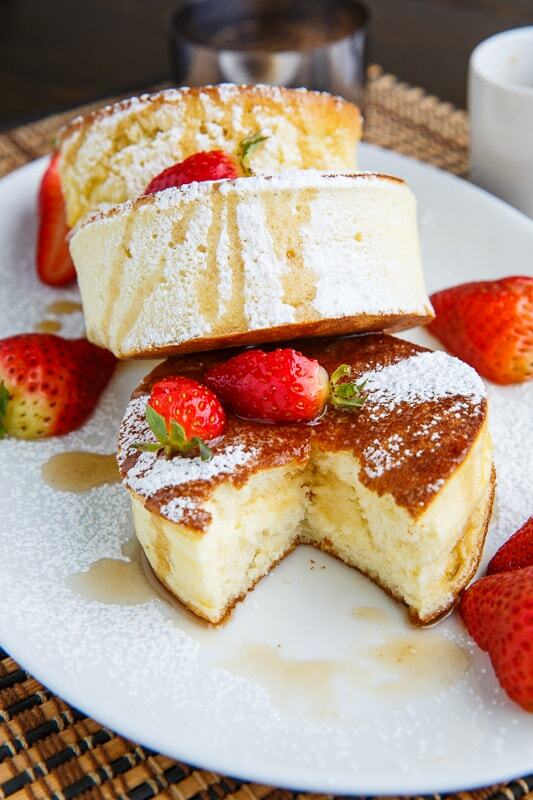 These Japanese souffle pancakes take a little bit more effort to make than regular pancakes but that light fluffy souffle like texture is well worth it and they are sure to please mom on Mother’s Day, or anyone, on any day really! I like to serve them topped with a fresh homemade lemon curd and blueberries! Cream of tartar is added to the egg whites to help stabilize and maintain the air in the egg whites and then in the pancakes but you can omit it. These pancakes are also divine with maple syrup! The metal ring that I used to cook the pancakes is in the top of the photo. Beat the egg whites, sugar, and cream of tartar until stiff peaks are formed. Mix the flour, baking powder, baking soda, and salt. Mix the egg yolks, buttermilk, mayonnaise, vanilla extrtact, sugar. Mix the wet ingredients into the dry ingredients until just incorporated. Gently fold the beaten egg whites into the batter 1/3 at a time. Heat a greased/oiled pan over medium heat, place a greased/oiled metal ring about 3-4 inched diameter and 2 inches tall, in the pan, fill it half way with baatter, cover the pan with a lid and cook until the bottom is lightly golden brown before gently flipping the ring, with the pancake in it, and cooking until the other side is also lightly golden brown. Repeat with remeaining batter. 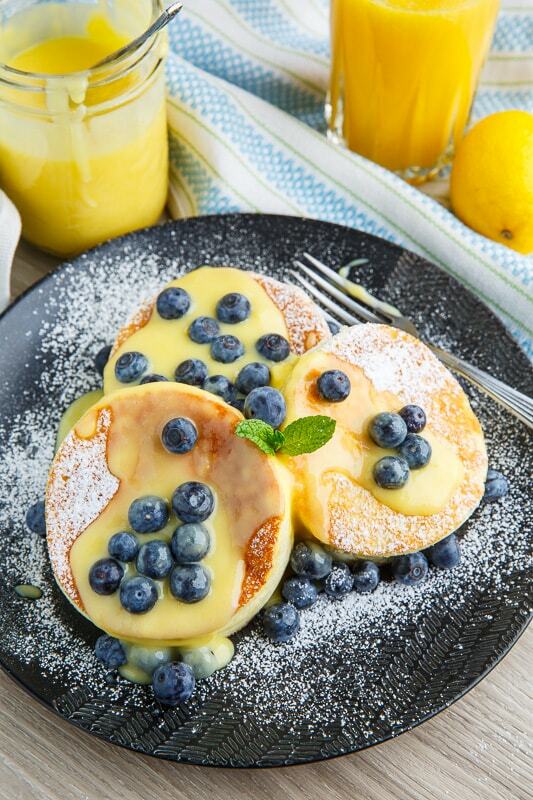 Serve the pancakes topped with lemon curd and blueberries! Tip: Make a cardboard ring by cutting a 2 inch tall strip of cardboard out, taping it up in a circle and taping wax paper on the inside to prevent sticking! Note: You can use english muffin rings, cut up empty soup cans, a metal plating rings, etc. to cook the pancakes in. Note: To cook the pancakes without a ring place 1/3 cup batter on the pan cook until lightly golden brown on the bottom before, placing 1/4 cup more batter on top before flipping to cook on the other side until lightly golden brown. 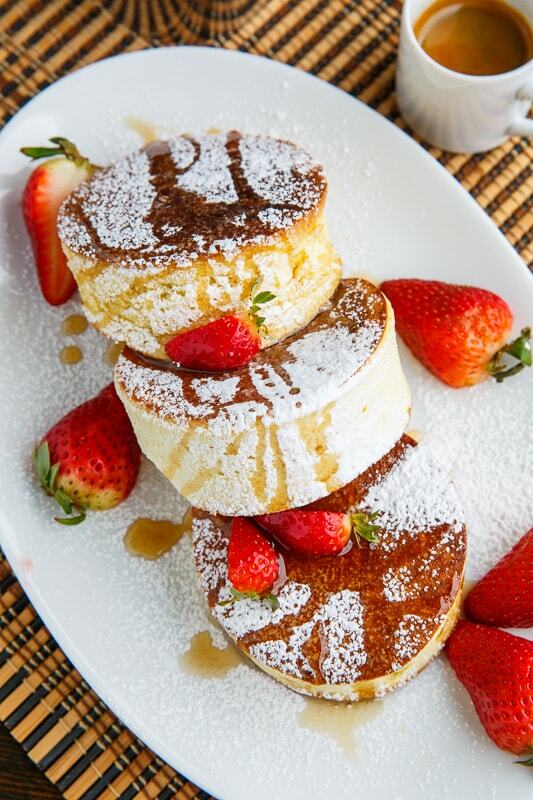 Option: Serve with your favourite pancake toppings like maple syrup, honey, berried syrup, fresh berries, etc. Looks like some very different pancakes there. I love lemon curd. And I really like thick fluffy pancakes for sure. Thanks for this recipe. Tina Dowell: I have not tried these with gluten-free flour. They should work but they would likely need tweaking to get it right. These are inedible. Way too sweet.